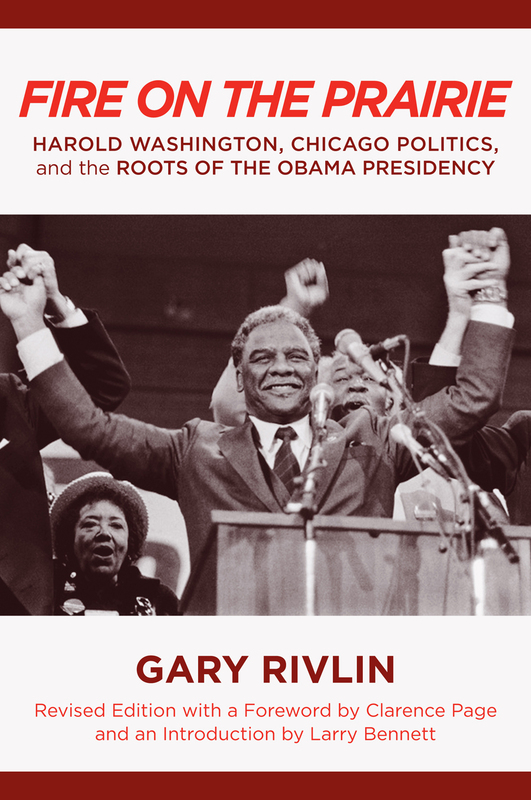 Gary Rivlin, author of Fire on the Prairie: Harold Washington, Chicago Politics, and the Roots of the Obama Presidency, reflects back on Chicago’s first black mayor on the anniversary of his passing. He was the first black mayor of Chicago, a city whose black populace had endured innumerable indignities at the hands of its fabled political machine. Yet to sum up Harold Washington as a racial pioneer and little more is to diminish the man and all that he accomplished. Behind him amassed a multiracial coalition consisting of blacks of all political stripes along with white progressives, Latinos, Asians, and gays, all organized around progressive totems like affordable housing and a more equitable distribution of city resources. Jesse Jackson would get his political start in Chicago; so, too, would a young community organizer named Barack Obama, who found inspiration in Washington. For decades anti-machine crusaders had tried but failed to reform. But even today Washington, who served during the 1980s, still looms as a before-and-after figure in the city’s history. Under Washington, Chicago saw the implementation of any number of good-government reforms, from the freedom-of-information act he signed to the steps he took to tame a bloated, inefficient city budget. He opened up the contracting process to women- and minority-owned businesses, shifted the focus of economic development from downtown to the neighborhoods, and gave voice to Latinos, gays, and other Chicagoans long locked out of City Hall. Harold Washington died 25 years ago yesterday. His death represents one of those where-were-you-when-you-heard the news moments, at least for Chicagoans of a certain age. Me, I was in my car, listening to NPR on my way home from some last minute Thanksgiving shopping. There was something strange about how the world learned the news: from Tom Bradley’s office, in Los Angeles, which had sent out a press release offering the mayor’s condolences. I was a staff writer for the city’s alternative weekly, the Chicago Reader, and I nosed around in search of an explanation. It turns out that allies of Washington were keeping the lid on the news of the mayor’s death until their preferred successor could make it to the hospital, where he would appear with the doctors in a press conference. Meanwhile, word of Washington’s passing had spread among a small fraternity of black mayors of large cities. Putting the kibosh on tragic news for political reasons; It was quintessential Chicago. Like a lot of Chicagoans, I was crushed by the news of Washington’s death. I was sad for myself, no doubt. I had just done the first of what was supposed to be a series of interviews with him: about his life and his time as mayor for the book that eventually would be called Fire on the Prairie. From my narrow perspective, I’d be denied the pleasure of spending time with an interesting and larger-than-life figure. But mainly I was crushed by what it meant for the city and the movement I believed in. Imagine the fierceness of the legislative opposition Barack Obama faced in the last two years of his first term: that was nothing compared to the nastiness and resistance that confronted Washington at every turn through his first few years in office. Finally, he consolidated his power with his election to a second term. But then six months later, he would be dead and the multiracial progressive coalition that had assembled behind him fell apart. Within a few years, again Chicago would be run by a Daley. Temple University Press is proud to be celebrating University Press Week. Initiated by the American Association of University Presses (AAUP), University Press Week highlights the extraordinary work of university presses and their many contributions to culture, the academy, and society. takes you around the globe by showing where our influence is felt in the 2012 seasons. Red pins illustrate the broad geographic areas covered in just our 2012 books, ranging across four continents and fourteen countries. Green pins represent countries where local publishers have licensed the rights to TUP books in their particular languages. Yellow pins represent cities where 2012 Temple University Press authors work. 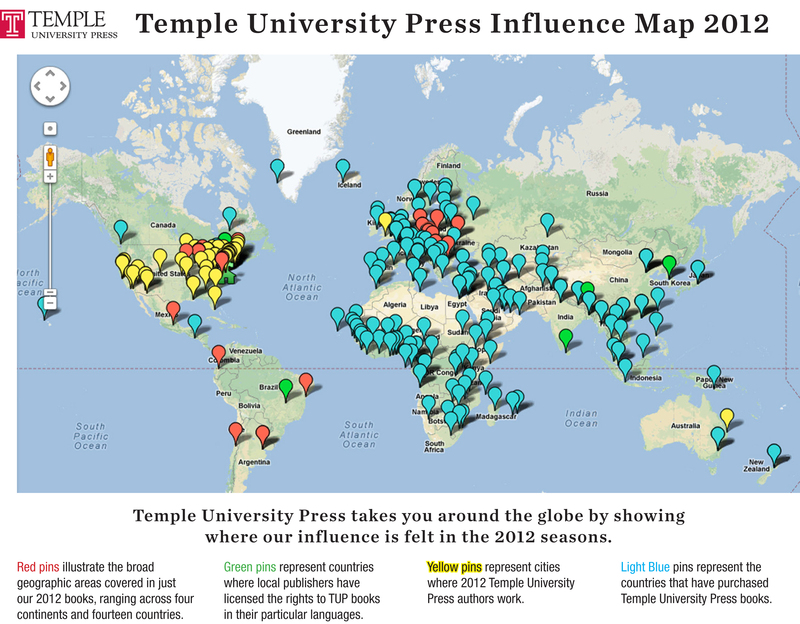 Light Blue pins represent the countries that have purchased Temple University Press books. Temple University Press used its Spring and Fall 2012 catalogs to determine what titles/authors and countries to feature for this map. One we started plotting we were happily amazed at the extent of what we were able to cover with just this one year of data. We did have to make decisions on how to represent things–e.g., using a capital city to represent a country/geographic region–we also reviewed the complete information carefully to make sure it did accurately represent the influence/coverage of Temple University Press books. As the University’s slogan boasts “Temple Owls Are Everywhere” so too are Temple University Press books! 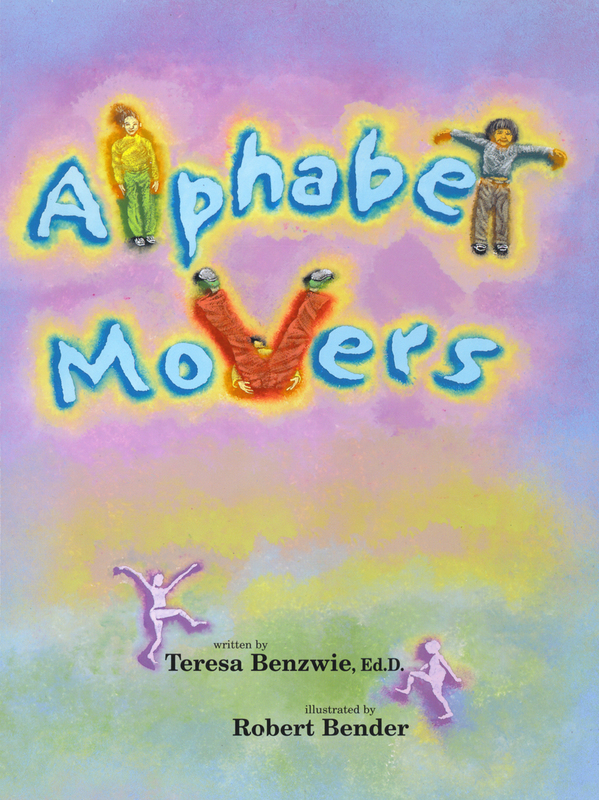 In this blog entry, Teresa Benzwie, author of Numbers on the Move and Alphabet Movers talks about using creative movement to teach young children numbers and control while helping them feel good about themselves and one another. I walked into my grandson’s kindergarten classroom and was immediately taken by the relaxing and gentle atmosphere. No florescent lights, just fun looking lamps giving the environment a feeling of home, children’s art work all over the walls and ceilings and happy children chatting in conversational tones. Their teacher Bruce was smiling and welcoming. What a wonderful place to spend a school day! 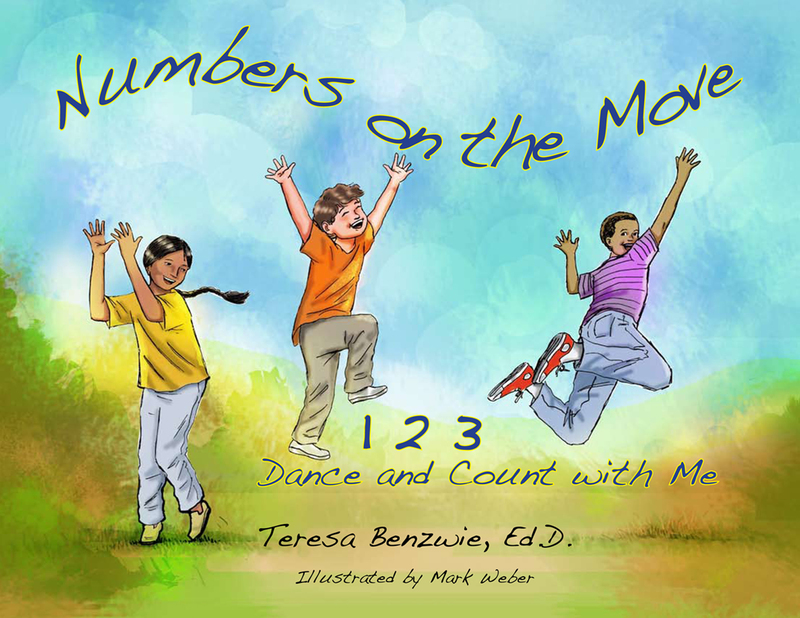 I had been invited to give a workshop in learning numbers through movement with my book Numbers on the Move: 1-2-3 Dance and Count with Me. I was introduced to the children as Misha’s grandmother who wrote a book and was going to share it with them. Picture a group of adorable children immediately finding a seat on the floor right in front of you. They are all looking up at you wide-eyed with expectant expressions on their sweet little faces. I took a few moments to drink in the magic of this scene. I began by saying, “I would like to learn your names. We will all say our name and use a movement for each sound. I will begin”. Ter-es-a, clapping my hands 3 times. How many sounds did my name have? “Three”, they all called out in unison: “Good” I say. “Let’s go to the next one. Can you move a different part of your body to the sounds of your name?” John-ny, as he punched the air two times. We all repeated Johnny’s name and did his movement and called out “two” for the 2 sounds in Johnny. We thus went around the circle of children until all had a turn. One little girl, Sally, was shy. She whispered her name and didn’t want to share a movement. Thus she shrugged as in, “I don’t know”. Encouraging all to participate we used that shrug as her movement while we all said Sal-ly. A smile crept over Sally’s face as she slowly lifted her head to acknowledge our support. It is not unusual for some children not to want to participate, however, it is almost impossible for them not to move in some way. Whatever small gesture is offered is what we use as their movement. This simple activity of saying their names in syllables with movement has many advantages such as building self-esteem. Each child gets his or her place in the sun when recognized. Physically they are inventing how to move different parts of their body. Socially, they are cooperating and acknowledging each other when they listen and repeat a child’s name and movement. Academically they are learning syllables, counting, and categorizing. Children may separate into groups. All children with 3 syllables, 2 syllables and 1 syllable will be in three different groups. Creative movement isn’t only about movement. It is also about control. To count to five and take only five steps is difficult for many. Learning how to stop moving at a certain number takes conscious control. Children’s self-regulation blossoms without their even realizing it! We have seen children who have been doing this exercise over time increase their movement vocabulary and actively share their creative ideas. After only three sessions, one classroom teacher where my dance students teach excitedly told us that her children were becoming more focused and participated more actively in lessons throughout the school day. Creative movement helps children integrate abstract symbols and ideas in concrete ways helping them learn. These days there are so many children who find it difficult to sit quietly so why not use their natural energy constructively. Children have so much to share and are happy to do so when encouraged. When their ideas and contributions are incorporated into the lessons they feel appreciated and accepted and learning becomes fun and meaningful. Teresa Benzwie, Ed.D. mentors dance students from Temple University in the use of creative movement in the early childhood curriculum at the Barclay School in Cherry Hill, NJ. Her books and/or videos include: A Moving Experience: Dance for Lovers of Children and the Child Within, More Moving Experiences: Connecting the Arts, Feelings and Imagination, as well as Alphabet Movers and Numbers on the Move: 1-2-3, Dance and Count with Me. This week, Stephen Greenspan, author of Elements of Discipline, outlines his new book, which provides nine principles for teachers and parents. My book Elements of Discipline, has been percolating for a long time: it is based on an article I published over 20 years ago. The book grew out of my long-standing interest in social competence, in that the main purpose of discipline (aside from maintaining classroom/ family harmony) is to facilitate the development of social competence in children and youths. Also, the ability to maintain harmonious and effective relationships with young people is a form of adult social competence, while inability to do so is a form of adult social incompetence. As a long-time professor in the school of education at the University of Connecticut, I was dismayed by the absence of meaningful training in behavior management given to those about to enter the teaching profession. This contributed to the large numbers (some estimates as high as half) of new teachers who quit the teaching profession within their first five years, citing inability to control their students as the main reason for becoming disaffected. 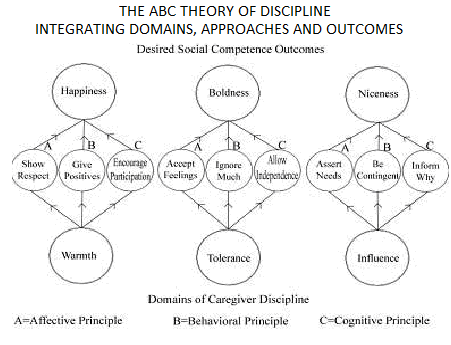 My book presents a comprehensive framework (what I call the “ABC Theory of Discipline”) which integrates principles from the three major discipline education systems: (a) Affective (Freudian), (b) Behavioral (Skinnerian); and (c) Cognitive (Adlerian). The nine principles of discipline are generated as follows: For the domain of Warmth, the principles are “Show Respect” (Affective), “Give Positives” (Behavioral) and “Encourage Participation” (Cognitive). For the domain of Tolerance, the principles are “Accept Feelings” (Affective), “Ignore Much” (Behavioral) and “Allow Independence” (Cognitive). For the domain of Influence, the principles are “Assert Needs” (Affective), “Be Contingent” (Behavioral) and “Say Why” (Cognitive). The resulting nine principles, or elements, provide caregivers–teachers, parents, early childhood workers–with a larger and more diverse toolkit than would be the case if they operated within one of the three discipline systems. Thus, caregivers are able to mix and match principles in a manner suited both to their own style as well as each situation which confronts them. The key thing, to me, is being accomplished in all three domains, but considerable flexibility exists for how to achieve that balance. One additional benefit of this framework is that it enables caregivers to become more discerning consumers of discipline literature. Most existing books do not make their theoretical underpinnings clear, or may present a system that is insufficiently comprehensive. This book should help caregivers know when a discipline expert or manual is to be taken seriously or dismissed as rhetoric masquerading as science. Elements of Discipline not only includes the theoretical but it also provides concrete tactics and techniques for dealing with specific situations. I hope readers find such advice useful, as specific challenges, such as a student insulting an adult, require a specific response. The book also contains a “toolkit” of eighteen statements that are useful for hosting discipline workshops, as well as many tables and figures intended to make the theory understandable on a visual level. This chart below shows how the model integrates domains of disciplines, outcomes of discipline and the three approaches to discipline. 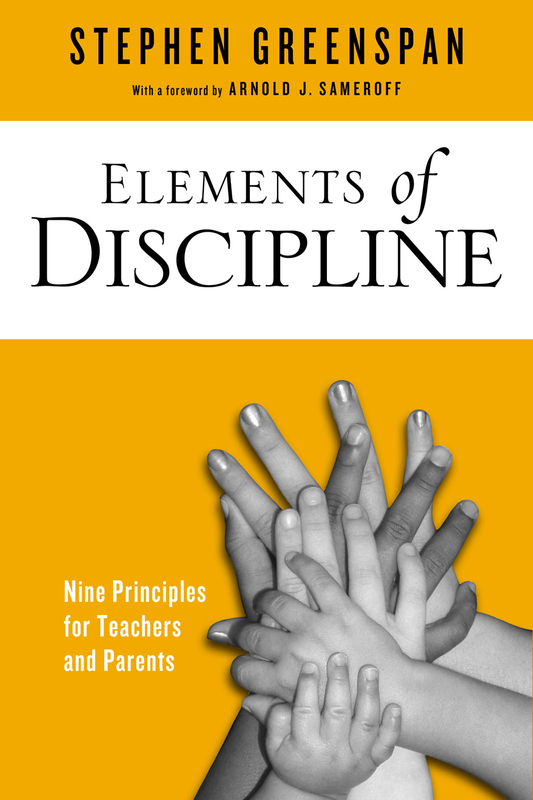 I hope Elements of Discipline is useful to educators, parents, caregivers and administrators. I welcome readers’ feedback.